Over the last few weeks I have been following an interesting medical path in French Catalonia. On May 24 a short ride in a fast ambulance and an emergency operation brought to a halt the painful effects of an inflamed appendix coupled with an abscess on my abdomen wall. I was discharged from hospital a couple of days ago and am now holed up in a hotel near Perpignan with my wife, an iPod full of Bach, Jonathan Harvey and Titi Robin, and some good books while awaiting medical clearance to fly back to the UK next week. Thanks go to my quite wonderful family and apologies to the monks at the Dashang Kagyu Ling - Temple of a Thousand Buddhas for cancelling my stay at such short notice. Blogging will be resumed but bear with me if it is somewhat sporadic. 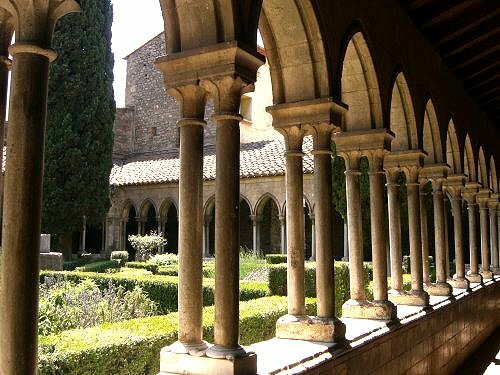 Header photo was taken at the Abbey of Arles-sur-Tech shortly before my appendix intervened. More on the composer who set Thomas Traherne's Intimations of Immortality here. Sorry to read about this. Best recovery. I was wondering where you were, imagining you having fun. Speedy healing! Feel better! Always nice to hear your thoughts. Get well, Monsieur Pliable. Lots of love. Get well soon, pli! Judging by the hotel, mortality doesn't seem too bad a fate! :-)Have you seen wings of desire, btw? Billoo, thanks for that. Yes, the hotel is quite nice. But one of the downsides of mortality is hospital food - even in France! Wings of desire are currently limited to vin rouge which I am not allowed to drink for a while. Sorry to hear your news - hope you're soon feeling better. What a drag! I'd been thinking of you off gallivanting around, having fun, poking around galleries and record shops, photographing signs and sights, and looking and listening for musics offering "transmission". Glad you seem to be over the worst and wishing you a speedy recovery.